UNCLE SERYOZHA has lost his marbles, and, very spryly for a man of his age, jumps onto the running board of the general conversation in order to dictate its itinerary: the storied times when sour cream was so thick a spoon would stand upright in it, and he could have dinner for a ruble and still have enough for a Belomor smoke and beer, keg beer with some heated beer poured into the cold, and salted crackers shaped like rings . . . . Now it’s all over: the hosts are embarrassed, the guests slink away. Uncle Seryozha—that’s me. And our telephone number, my dears, was G9-13-34. One evening when our parents had gone to the movies, the neighbors’ drinking party gushed over into our living space, and Vladimir Gavrilych, in a dark-blue T-shirt, loose black trousers, and bedroom slippers on his bare feet, played the front-line song “Katyusha” on my mother’s Mühlbach piano with candelabra [old Russian upright pianos are equipped with candleholders on either side of the music rack]. Our neighbor Vladimir Gavrilych hadn’t had occasion to fight, because he had chopped off the index fingers of both hands at just the right time, which did not prevent him from pounding on the keys, yelping boldly, on May 9, 1958. It was rather frightening. “Remember this day your whole life long, Sergey,” he adjured me, while in his enforced embrace I was overcome by the smell of vodka, onions, and armpits. And I did remember. Once the prison-gangster-in-training Shurik Batashov urgently invited us neighborhood youths to his place and “spilled his seed” into a saucepan, as it is written in Holy Scripture, for our edification. It was instructive. Once my father, impassioned by a convivial Thaw-period conversation and forgetting the audibility of the communal apartment, exclaimed in the wee hours that Stalin was the spawn of Lenin. It was enough to take our breath away. As for all the rest—music school, the dominant seventh chord, God forbid, plus my quixotic extracurricular reading—Isabelle what’s her name, de Croye [from Scott’s Quentin Durward]. A mixture of intelligentsia upbringing with the studies of the street tuned the future of the lyric hero to an ambiguous harmony. On the weekends in spring or warm autumn, my parents would pack sandwiches, a thermos of tea, and badminton rackets into a bag with a shoulder strap, and we would go to what was then the last stop on the Fili subway line and then in a bus along the Rublyovsky Highway. We would find a clearing and play badminton to a fifteen-point knockout. It was great. The rackets would moan softly under the blows, the shuttlecock would whizz, my father, his mouth open wide with happy fierceness, would foil or return my mother’s low serves, and my mother would move with the enchanting grace of a large, unathletic woman who was still full of life. My brother and I, playing dirty little tricks on each other, would wait our turn. And it came, the turn of youth. I was an ugly duckling but became a handsome gander. I was a pensive plant in crooked glasses but became a young Muscovite who had a high opinion of himself. And Moscow was transformed from the place where I was registered into something like the only possible milieu for habitation. The fifteen years of my early and late youth now appear to me as one continuous half-drunk nomadic wandering around the center and outskirts of the huge and unfriendly city. “The youths are on the move,” our compatriots would say as we passed, and they were right. I took part willingly and diligently in the doings and idleness of that guild of slackers known in current art-historical parlance as the “underground.” This involvement often presupposed, among other things, bohemian behavior with all its merits and defects. We were writer-rowdies, or at any rate we tried to be—that was the fashion then. Certain wild men achieved true virtuosity in the art of raising a ruckus. My talented comrade Arkady P. managed to roll a trolleybus out of the dead-end street in which it was spending the night and then sent this means of transportation, crammed with his male and female drinking buddies, freewheeling down Great Pirogovskaya Street. “They don’t make heroes like that any more!” [from Lermontov’s 1837 poem “Borodino”]. The late Aleksandr Soprovsky and I never set the town on fire like that. It’s true, on one of the anniversaries of the October Revolution my reckless and of course dead-drunk comrade jumped up and tore down two or three red flags in one of the lanes of the Arbat. I, the tipsy witness of these tricks, almost lost control of my bowels. People of my generation and older are in a position to appreciate Soprovsky’s deed according to the bill of fare of the Criminal Code of the Russian Soviet Federal Socialist Republic. And now, as I promised, about my beloved sculpture. 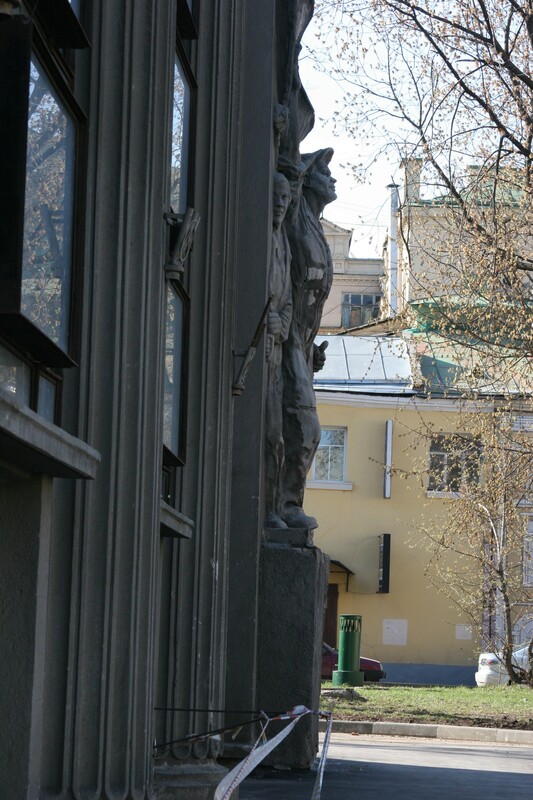 At the corner of Great Nikitskaya (formerly Herzen) Street and one of the Kislovsky lanes, right opposite the zoological museum, there stands a rather ugly gray building with pilasters. If you steal up to it on tiptoe, your heart pounding, from the direction of the Manège Square, and stand at attention precisely at the third pilaster, before your eyes will appear a raptly masturbating shock-worker of Communist labor—maybe a Stakhanovite miner, maybe a hero-builder of the subway. There are aficionados who like to catch other monuments of the capital in the act of self-abuse, like say Timiryazev on Nikitsky Boulevard or Tchaikovsky by the Conservatory. But in these cases, to everyone’s regret, the depravity of the wretched hunters themselves is on display. To an unbiased eye, there is not a hint of anything blameworthy in the monuments to the scientist and the composer; I have checked repeatedly, “have looked as assiduously as possible” [quotation from Eugene Onegin, Chapter 8]. But as for my touristic attraction, it is impossible to see anything else, if you approach it from the correct angle. It’s unbelievable, but we are dealing here with a classic case of sabotage—only a ten-minute walk from the Kremlin. Oh, how many times have you come to my rescue, obscene idol, when my enchanting companion would begin to get bored and suddenly remember mama’s nerves and papa’s heart condition, and the luckless Don Juan’s powers to distract the beauty with smooth talk were running dry! How the unimpressive little park would resound with indecent maidenly laughter, and immediately the hope would be resurrected that papa and mama would be forgotten, and the seduction would succeed! The charm of the high-relief sculpture would unfold in its fullness when you quickly compared the activity, if you’ll pardon the expression, of the exemplary factory worker with the look on his face. He would labor indefatigably, as the young ne’er-do-well Shura Batalov once did as a demonstration for the communal-apartment kids, and the monument’s profile, lifted to the heavens, would shine with inspiration, like the physiognomy of Vladimir Gavrilych, our neighbor, as he performed the army song. Or like mine right now. After all, recollection is also a sort of fornication, a useless indulgence of the imagination. . . . Time to stop. But just one more time, the last one for today, toward the end of the play: how are things going with the family in the pine grove on the Rublyovsky Highway? How’s the game, what’s the score, who’s winning? Is everything the same? It’s the same as always, only the visibility is poor as usual, as if through dusty glass. I should have fixed them better in my memory, God knows I wasn’t a baby, already eight years old, and I already knew, even if only by hearsay, that people are mortal. But I couldn’t imagine just how mortal . . . .
And where is the ill-starred briefcase now? Isn’t its phantom visible in the twilight next to the familiar bench? And indeed something is showing dark there. But nowadays you’re afraid even to go near it, you might stumble on an incendiary device. And the monument stands as it always did, but it’s not easy to get near it because of the constant construction. By the way, the first definition of the word “monument” in Dal’s dictionary is “anything made in order to facilitate memory.” Precisely. © Sergey Gandlevsky. Published with the kind permission of the author. This entry was posted on Friday, August 21st, 2009 at 9:56 am and is filed under Guest Author, Prose, Reading, Watching. You can follow any responses to this entry through the RSS 2.0 feed. You can leave a response, or trackback from your own site.